This post brought to you by VTechKids. All opinions are 100% mine. V-Tech was nice enough to send Drew a couple of their new electronic toys called the Switch & Go Dinos! This product was first available for sale on May 21, so they were literally hot off the presses. When Drew saw Silver the T-Rex and Horns the Triceratops, his face lit up like it was Christmas morning. He was all like, "Yessss! My Mom being a blogger has FINALLY paid off. I thought this day would never come." V-Tech's Switch & Go Dinos are dinosaurs that easily transform into cars. They come complete with fancy-schmancy LCD screens and easy-to-operate buttons that are perfect for tiny fingers. This spells hours of fun for your little one. The LCD screen allows for interactive play because you can choose your own race car driver to display. Drew named his driver "Drew" because he was "the fastest driver that ever lived". When he changed the car into a dinosaur, the LCD screen changed automatically, too - bringing the dino to life with customizable eyes, sound effects and dinosaur facts. I loved that Drew was learning while he was playing. When I took the toys out of the box, I was a little nervous because I'm intimidated by electronics. If you want to make me feel really stupid, just ask me to set up your DVR. In fact, the last time that I tried to do that, it was called a VCR. Ahem. So I pulled out the instructions and pretended to be reading them - killing time until Brian felt sorry for me and took over. But guess what? I didn't have to! 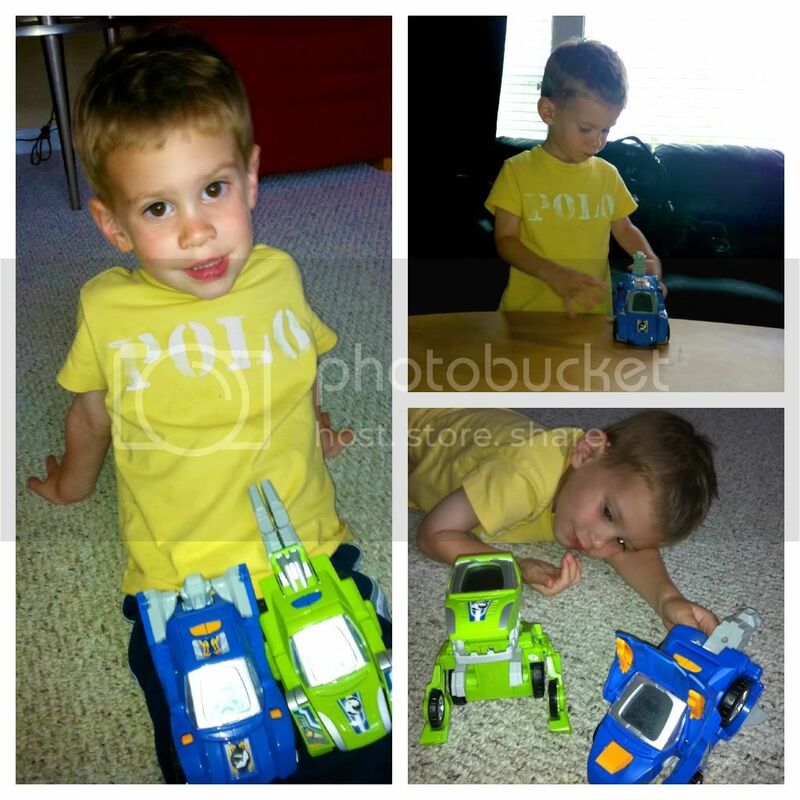 Drew picked up the dinos and started playing. Easy. Fun. Frustration free. A happy child AND impressing your husband? Now that's a win-win. Buy today on Amazon for only $15.99. That's like getting two toys for the price of one! There are four different dinos available now exclusively at Amazon and VTechKids. Three more Switch & Go Dinos will be added this Fall when they hit retail stores everywhere. I'm heading over to Amazon to order the red and yellow dinos to complete Drew's collection. And I know exactly what I'll be buying Drew's friends for their birthday.